This mini-kit includes resin detail parts, decals, and Tichy underframe, turnbuckles, queen posts, and K brake parts. 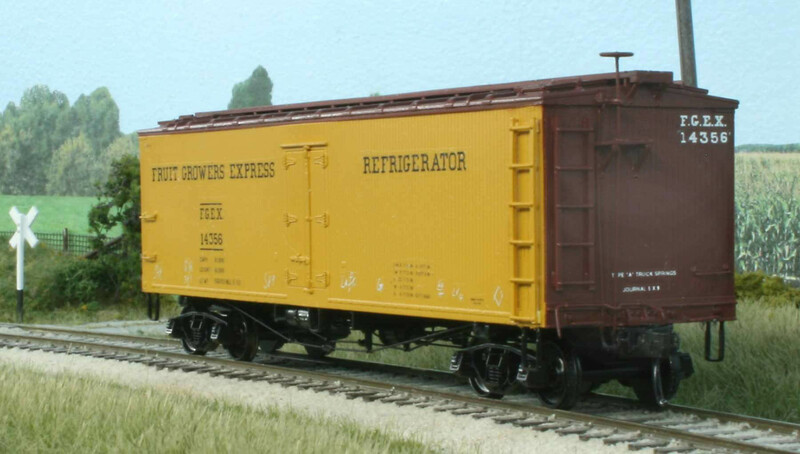 The modeler will need to supply the Accurail reefer car body, truss rod material, some wire, trucks, wheelsets, and couplers to complete the conversion. Frank Hodina created the HO scale resin parts masters and Tom Madden cast the parts. Ted Culotta created the fine decal art. Additional details and ordering information can be found on the Resin Car Works web site. The prototype FGEX reefers originally came from the Louisville & Nashville and Baltimore & Ohio as they came into the Fruit Growers consortium in the early 1920s. The truss rod cars were in service for many years. These mini-kits are a limited offer. Once the decal sets are gone, the parts will no longer be available. Ordering information can be found on the Resin Car Works web site. What Years were cars used? I am modeling Erie Lackawanna in 1968 in the southwest New York State.